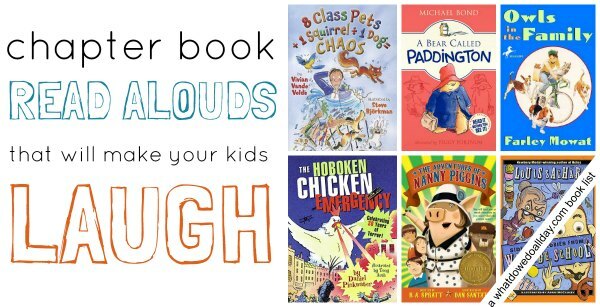 This list of funny books to read aloud is primarily (with a few exceptions) composed of books that can be found elsewhere on my book lists, but a few days ago a fellow parent and I were chatting about how much fun it is when our kids laugh out loud when we are reading. I thought maybe it would be useful to share which books made my kids roll with laughter. I don’t mean a giggle here and there, or a smile and a chuckle. These are the books my kids truly found hilarious. I shared The Adventures of Nanny Piggins with my facebook audience (join us there to keep abreast of our current read alouds! ), but not here on the blog yet. It is one of the funniest books I’ve read in a long time. This popular Australian import is a series about three siblings whose father is so frugal he hires a pig to take care of them. Nanny Piggins is no Mary Poppins, however. The enthusiastic circus pig thinks school is overrated, chocolate is a food group and takes the kids on “marvelous adventures.” This is a great book for kids (and adults) who enjoy Roald Dahl, and over-the-top, subversive humor and plain, good fun. If you prefer moral didacticism, move on. 8 Class Pets + 1 Squirrel ÷ 1 Dog = Chaos is perhaps the book that elicited the most laughter in our house ever. The story begins when a dog chases a squirrel into a nearby elementary school. The squirrel runs from classroom to classroom leaving chaos in its wake. Each chapter is narrated in the first person by the various class pets that inhabit the classrooms. The pets range from hamsters to snakes to fish to birds and getting their different perspectives on the ruckus is extremely entertaining to say the least. The Hoboken Chicken Emergency . With a nod to my neighbors in New Jersey, you have to admit that any book which couples “Hoboken” and “Chicken” in the title has got to be hilarious. When there are no turkeys to be found anywhere in Hoboken for Thanksgiving dinner, Arthur returns home with a chicken. The problem? The chicken is 266 pounds. Hijinks ensue. I read this aloud to my sons and they loved it. Winnie-the-Pooh . I recently read the Pooh stories out loud to my 5 year old and I was surprised at how how much he laughed. I’ve never thought of them as funny, I guess because when I read them to my older son when he was around 4, he never laughed. But my younger son’s giggles at the scrapes Pooh gets himself into made me see the story as quite a little droll comedy of manners. Sideways Stories from Wayside School . I like reading this book about a wacky school environment to the kids. I think it’s good to allow them an outlet for thinking about school in a non-traditional (dare I say “subversive”) way. While my 5 year old did laugh along, the humor was more suited to my 9 year old. Both kids who love the silly and ridiculous and parents who appreciate well-written, humorous books will find something to charm them. Ramona the Pest . It took me a really long time to introduce my kids to the mischievous and throughly lovable Ramona Quimby, but it was love at first read. Come to think of it, my boys first met Ramona in Henry Huggins (another laugh out loud read). Ramona is constantly getting into trouble but the wonderful thing about this series is Cleary’s masterful ability to capture the inner life of a child, in a way to which all children can relate. I would even argue that these books teach us empathy through laughter. Mr. Popper’s Penguins . This Newbery Honor book from 1938 is still as funny today as it was then. Mr. Popper and his family adopt a penguin sent to them by a famous explorer. The brood grows to 12 penguins and the laughs begin. We first listened to this as an audiobook when my youngest son was almost 4 and he enjoyed it immensely, especially the scene in which the Poppers flood the basement with water, then freeze it so the penguins can slide around their home. Owls in the Family is a short chapter book about boys growing up in Saskatchewan in the 1950s. One of the boys adopts a pair of great horned owls. The owls, added to the family dogs, the pen of rabbits and gophers (in which the owls miraculously co-habit) bring hilarious chaos to the boys’ lives. We have read this book aloud 3 times now 4 times and I expect we will read it again. Tales of a Fourth Grade Nothing is the first in Blume’s Fudge series about Peter Hatcher and his 2 year old kid brother, “Fudge.” Older siblings everywhere will relate to Peter’s exasperation at his messy, loud, trouble making brother, especially since Peter seems to get the lion’s share of blame. What about you, what are some of the funniest chapter books you’ve read to your kids? What have I overlooked? Please share in the comments. I would love some new suggestions! I’m so excited about this list! I have to add “Toys Go Out,” which had us laughing out loud so many times. I learned about that series from your blog, and can’t wait to read the books from this list I just reserved at the library. Thanks as always! Does it get any better than funny book? Really? This is exactly the type of writing my daughter enjoys which is probably why we love the funny books so much. Mo Willems “Don’t Let the Pigeon Drive the Bus” is still one of our favorites, too. My daughter (now 11) loves the Percy Jackson series because of the humor in it, now that I think of it, most of the books that she re-reads are funny. I think I need her to make me a list. 🙂 Duh, duh…duh. Thanks for sharing this on the #KidLitBlogHop. I adore this post. We just started Homer Price and it’s hilarious! Pippi Longstocking and the Mercy Watson series. Funny is what gets kids reading! My son thought Timmy Failure is hilarious and the vocabulary in that book is surprisingly advanced. What a fun list! Thanks for sharing at the Kid Lit Blog Hop! Great list! My 8 year-old really enjoyed all of the Wayside school books but his all-time favorite so far is the Diary of a Wimpy Kid series. Even the adults loved these books. Yes, those Wayside books are so funny! You need to try Half-Magic. The scene with the cat was my kids’ favorite. We love Half-Magic. It is on several of my other lists! Great book. Hi, I just found your site and book lists and I’m excited to try some of the ones we haven’t read. 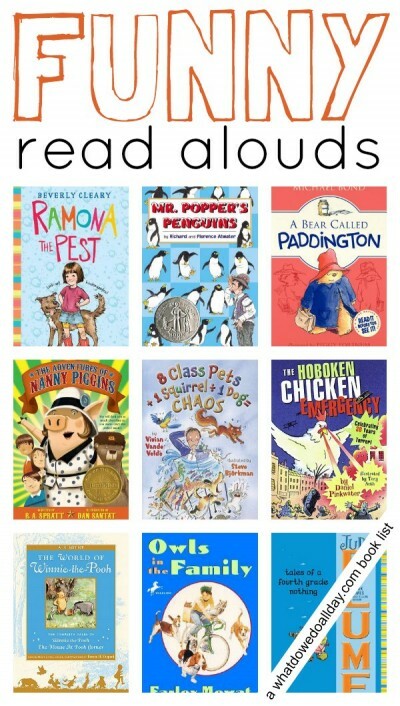 Our favorite funny read aloud series isn’t on here anywhere that I’ve seen, however, though I may have missed it. We LOVE the Junie B. Jones series by Barbara Park,and have read all the books multiple times. Even the three year old enjoys them, and our five and eight year old kids still like to hear daddy read them aloud though they have read them all independently as well. Some people are put off by the incorrect “kid” grammar in the books, but we haven’t had any problems with it changing the way our kids speak. The books for older readers like “Skinnybones” are funny as well, but we haven’t found anything better than Junie B. Jones to keep our whole family, from youngest to oldest and parents too, laughing out loud! Thanks for sharing your experience. Happy reading! Any of The Moffats series! My husband read them aloud during a hard time and we laughed every night! Nice family memories. All about Sam and the subsequent books my 5 and 7 year olds, boy and girl, thought funny and interesting. I love the All about Sam book! Marge in charge by Isla Fischer.